Precision Manufacturing first produced the HyReach Clipper in 1992. Its patented features make it unique to the tree shear industry. 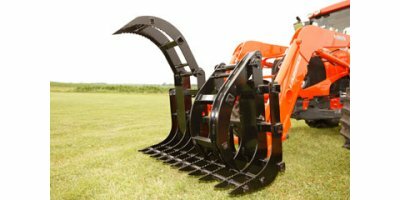 Our tree cutters and attachments are used for commercial tree cutting as well as by landowners to clean fence rows, pastures, timber and etc. The tree shear cuts all types of trees – DEAD or ALIVE! The maximum cut is between 9″ and 12″. Precision Manufacturing’s Add-A-Grapple and Grapple Rake make easy work of handling brush and debris. Our skid steer attachments and tractor attachments have been especially useful with storm clean-up equipment used for removal of damages caused by ice storms, tornadoes, hurricanes, and etc. The grapples and grapple forks are also useful for picking up hard to handle material. The Hy-Reach Clipper was invented in 1992. It was developed to solve the age-old problem of trimming hard to reach tree branches and unwanted trees. The tree shear design was made to eliminate the unsafe practice of trimming limbs with a chain saw from a loader bucket or ladder. The clipper was originally built in an unheated barn in Hughesville, MO and later moved into a new, modern facility in Sedalia, MO. In January of the year 2002, Precision Manufacturing, Inc. acquired the asests of P&W Engineering, the originator of the Hy-Reach Clipper tree shear. All employees remained on board and continued to produce the clipper and it’s mounts. In addition to manufacturing tree shears, Precision also manufactures a variety of grapples and tree pullers. Precision Manufacturing, Inc. uses only the finest quality of raw material and produces most of the components in house. The tree shears, grapples and tree pullers are used by professionals in addition to the many satisfied landowners. The Hy-Reach clipper has been used to clear hundreds of acres of land for golf courses. Several Federal, State, and City maintenance departments own and use the clipper. The Hy-Reach Clipper has been patented in three different countries.